Return with a brand new song entitled “Nothin’ Left 2 Do” a song recorded and produced in collaboration with Soul Junction Records during 2015 under the auspices of some of the City of Brotherly Loves finest musicians. We begin with the songwriters Lavern Bynum, Bruce Fauntleroy and Leroy ‘Shu-Baby’ Shuller. With the songs recording and mixes have been expertly done by producer, Craig White at Sound Doctor Productions LLC. Craig was the former studio manager at the world renowned Gamble & Huff studios. The mastering was done by Peter Humphrey’s at Masterwork Recording (USA). 2016 finally sees the initial release of “Nothin’ Left 2 Do” a song of forlorn hope for a former lost love, that’s oozes class from the opening horn riffs executed beautifully by Henri McMillians UGO Horn Section. But despite the songs sad lyrics the overall mood of the track is very pleasantly uplifting. The line up on this song features Philadelphians Leonard Deans, Tony McFarland, Bruce Fauntleroy (the songs co-producer), Alan Williams and Tony Anderson (a.k.a Tony Talent) who’s vocal ability is a throwback to the days of when nearly every street corner in many major US cites would resonate to a all male group harmony sound. A sound that these five gentlemen still regularly perform as a latter version of one of Philly’s finest harmony outfits ‘The Intrigues’ in the 360 Lounge of The Parx Casino. The b-side of this single features the now familiar “Didn’t We Almost Make It” a previously unissued 1979 recording that gaine its initial release as the opening track on the Coalition’s previous unissued album project “Colour Me Blue” (SJLP 5006) released during November of 2013. 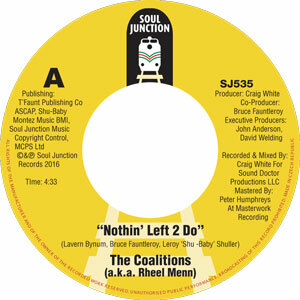 Although the whole of this acclaimed album received extensive airplay it was the opening song “Didn’t We Almost Make It” that really caught DJ’s and radio listeners imagination and prompted callers to beg the question as to whether we (Soul Junction) would ever consider releasing it as a 45 vinyl single, a call that we hope has now been answered. A slightly earlier and different line up recorded this song Tony Anderson (Talent), Alan Williams, Bruce Fauntleroy, Milton Williams and Stephen Ferguson being the performers responsible.